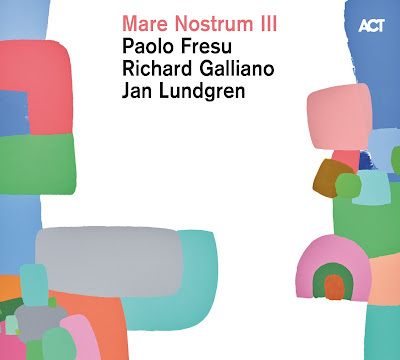 Mare Nostrum III (our sea, and the Roman name for the Mediterranean) is the third album by three musician-composers who grew up by the sea: trumpeter Paolo Fresu (Sardinia); accordionist Richard Galliano (France), and pianist Jan Lundgren (Sweden.) They bring their compositions and styles from their individual countries together, fusing them into new European music, both beautiful and serene. Galliano’s pieces are strongly melodic. The piano reverb on Blues sur Seine sounds as if it’s drifting from a distant shore; Lundgren sounds as if he’s drawing equally on Satie and Bill Evans. As the folk-edged tune unfolds, the accordion has real delicacy of feeling. You can hear the air fluttering like wings in the accordion’s bellows. Galliano also plays bandoneon and accordina throughout the album, and his solo on the latter has a high sweet purity. Le Jardin des Fées is in memory of Galliano’s friend Didier Lockwood. With its crisp minor Latin piano groove, it recalls Piazzolla (also a friend of Galliano.) Like many of this album’s tracks, it’s elegiac but uplifting, with its shimmering accordion chords and solos that stay close to the melody. Galliano’s compositions feel personal. In Letter To My Mother, the rubato piano folds warmly around the muted trumpet. The three instruments intertwine phrases closely. Prayer varies the timbres as the three instruments drop in and out, through several meditative moods; stormy deep piano chords resolve into a bright, hopeful world. Keeping a French mood, Galliano and Fresu play Legrand’s The Windmills of Your Mind unadorned. The tune speaks for itself. Toots Thielemans' harmonica played the original Love Theme From “The Getaway” (by Quincy Jones); Galliano keeps that feel on (what sounds like) accordina over the Jarrett-esque piano and trumpet. It’s like a boat rocking on waves. 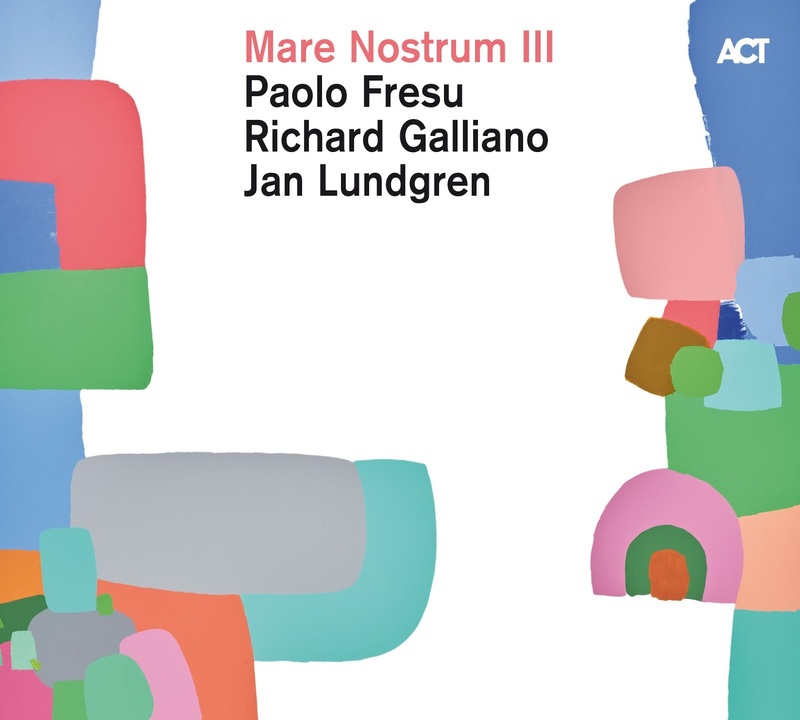 Lundgren’s four compositions bring gently different grooves. Love Land has an energetic Latin rhythm, the joyous melody spreading slowly over the full percussive chords. Accordion and trumpet phrases are tucked into each other. Ronneby evokes a Swedish town with a quirky tune, bluesy solos and lazily chromatic trumpet. Love in Return veers towards tango; short solos burst out happily, phrases jostling together. The Magic Stroll has a Gallic insouciance, redolent of Jean Françaix’ Flower Clock. Fresu’s Pavese has subtle key changes broadening out into a chorus recalling Pachelbel’s Canon, with heartfelt soloing from all. Fresu wrote Del Soldato in trincea (“Soldiers in the trenches”) for the 2014 film Torneranno i prati. Galliano creates a powerful sense of longing for home behind the plangent trumpet theme. Fresu and Lundgren play the former’s exquisite Human Requiem as a duet. It sounds cinematic too: each chord change is like a new camera angle. The trumpet is muted but punchy, and Lundgren recalls John Taylor in his way of playing jazz chords with a classical touch. Fresu’s Perfetta is perfectly poised in ¾ like a French Chanson. The accordina’s high countermelody reaffirms the trumpet, ultimately unresolved. Fresu plays the Neapolitan song I’te vurria vasà as if he’s playing muted lyrics. The accordion brings a nostalgic French atmosphere to the spacious jazz chords. Although most tracks are under five minutes, the musical detail seems to extend them. They’re deceptively simple. Like looking into clear water, you can’t immediately see the ripples and undercurrents of the chords and rhythms – you just appreciate the experience.